Mount Gilead High School Class of 1967 held its 50th Reunion Saturday, Sept. 16, at the Ontario Event Center. Shown, from left, are top row and standing: Debra Fate Rice, John Zimmerman, Gary Hobson, Tim Casto, Frank Slavik, Mike Pfeifer, Mike Barnett, Steve Brown, Cal Shirk, Clarence Keckler, David Hartpence. Third row and standing: Vickie Smith McKinney, Marsha Baughman Crawford, Betty Linscott Moodispaugh, Sandi Wehr Dion, Edna McHugh Bunting, Teresa Knox Soulier, Helen Farrington, Chris Mosier Bensley, Carol Pate Beach, John Geyer. Second row , seated: Charlie Shaffer, Sharon McCracken Kincade, Karen Smith Hildebrand, Marilyn Baker Ogden, Vickie Chubb Ahlefeld, Carolyn Neal Baldwin, Jenny Long Piccin, Alice Mosier Turner, Gloria Conkle Hershey. Bottom row, seated: Mike Hedrick, Judy Jagger-Mescher, Carol Kimball, Sherry Heacock Szep, Janet Hildebrand Cochran, Judy Phillips Goff, Bonnie McClelland Drake. 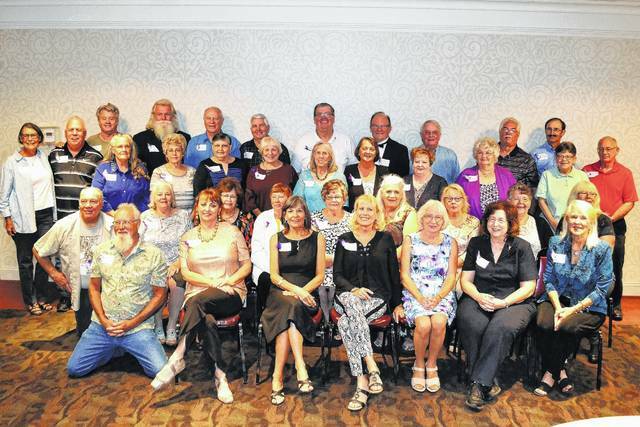 https://www.morrowcountysentinel.com/wp-content/uploads/sites/29/2017/09/web1_MG-CLASS-REUNION-1967.jpgMount Gilead High School Class of 1967 held its 50th Reunion Saturday, Sept. 16, at the Ontario Event Center. Shown, from left, are top row and standing: Debra Fate Rice, John Zimmerman, Gary Hobson, Tim Casto, Frank Slavik, Mike Pfeifer, Mike Barnett, Steve Brown, Cal Shirk, Clarence Keckler, David Hartpence. Third row and standing: Vickie Smith McKinney, Marsha Baughman Crawford, Betty Linscott Moodispaugh, Sandi Wehr Dion, Edna McHugh Bunting, Teresa Knox Soulier, Helen Farrington, Chris Mosier Bensley, Carol Pate Beach, John Geyer. Second row , seated: Charlie Shaffer, Sharon McCracken Kincade, Karen Smith Hildebrand, Marilyn Baker Ogden, Vickie Chubb Ahlefeld, Carolyn Neal Baldwin, Jenny Long Piccin, Alice Mosier Turner, Gloria Conkle Hershey. Bottom row, seated: Mike Hedrick, Judy Jagger-Mescher, Carol Kimball, Sherry Heacock Szep, Janet Hildebrand Cochran, Judy Phillips Goff, Bonnie McClelland Drake.